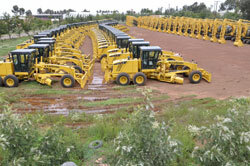 Asmara, 6 December 2011 –The nation has imported a number of new machineries that would make due contribution in reinforcing the multifaceted development. The modern machineries brought through Massawa Port include small and big lorries, firefight trucks, tankers and a number of construction and agricultural machineries. The machineries would be deployed to various construction works such as housing, infrastructure, dams, bridges and water diversion schemes. In addition, the introduction of agricultural machineries is expected to enhace the development of modern irrigation farming towards achieving food security. Furthermore, thier impact on creating job opportunities and upgrading know-how is not to be viewed lightly. The machineries purchased at substanial government expenditure would provide added impetus to step up their efforts towards realizing the set goal, apart from conveying a message of hopelessness to consparing enemy quarters.